news Australia and New Zealand Banking Group has revealed plans to spend up to $1.5 billion on a wide range of customer-facing technology systems and branch refurbishments, in the latest salvo of an intensifying battle between Australia’s major banks to position themselves as technology leaders. In a presentation yesterday, the bank revealed it was conducting a major rollout of Cisco-based videoconferencing systems within 43 remote branches nationally, in a move which it hopes will give regional customers greater access to specialist advice of the type usually only accessible in metropolitan areas. It also yesterday launched an iOS app for iPhone or iPad that allows customers to process same day credit and debit card transactions – boasting that the app can be used every day of the year. ANZ also announced the trial of mobile payments using Near Field Communications chips on Android devices, and it also launched a new mobile banking app, ANZ Transactive for Mobile, which allows businesses to “quickly and securely approve large payments while on the move”. Furthermore, the bank also announced it would introduce 800 ‘next-generation’ automatic teller machines into branches, which it said would allow 24 hour access to many traditional teller services. Other innovations include “significant investment” in the bank’s online channels, including the launch of live customer support chat functionality on the bank’s website. And a large amount of the funding will also go to a branch overhaul program, much of which is not directly related to technology. Simultaneously, the bank also revealed that traffic to its digital channels was rapidly increasing. In July 2012, for example, it was processing close to 30 million transactions through its Internet banking portal, and it has over 700,000 registered customers using its goMoney mobile payments app. Simultaneously, the number of branch transactions the bank is conducting are rapidly decreasing. “We know our customers prefer to do their day-to-day transactions in their own time either online or by using mobile devices so our task is to respond to this change by embracing the online and digital challenge and enable our customers to bank with us on their terms,” ANZ Australia chief executive Phil Chronican said. The bank is also simultaneously conducting a number of initiatives to boost the way it uses technology to serve its staff internally. For example, this week it said it was connecting customer information to deliver a single customer view for staff to access, and it’s establishing “a more scalable and efficient environment for customer data” to exploit the rapid growth in the amount of customer data it’s keeping. The bank said it was developing “deeper analytics capabilities” to exploit the investments it had made in “data platforms” and enhance the understanding it had of customers. And it’s also enhancing frontline sales productivity by simplifying the processes and systems with the aim to double the amount of time the bank’s staff spend with customers. News of the bank’s investment comes as its rivals have also been recently making significant investments in customer-facing technology. In July, for example, the Commonwealth Bank of Australia revealed several devices and an application development platform that together constitute an ecosystem similar to the Square mobile payments system which is becoming popular in the US for transactions at merchants such as retailers, restaurants and cafes. And in August, Westpac launched an app which would allow those with Android smartphones to make mobile payments through their embedded NFC chip. However, unlike ANZ, the majority of the other banks are also simultaneously investing in their back-office systems, especially the core banking platforms which underpin their entire business processes. In March 2011, CommBank chief information officer Michael Harte and other senior CommBank executives gave a briefing in which they repeatedly emphasised that CBA’s $1.1 billion revamp put it technologically between two and five years ahead of its rivals. Suncorp and NAB are pursuing programs to overhaul their platforms using Oracle software, while Westpac and its subsidiary St George is planning to upgrade its Hogan platform with new functionality delivered through CSC’s Celeriti system. 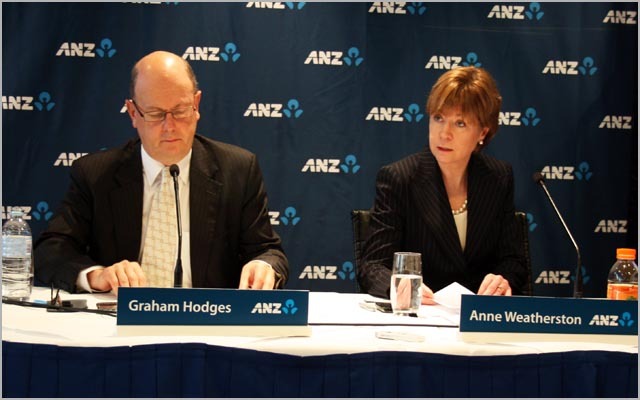 ANZ Bank chief information officer Anne Weatherston in October last year delivered a landmark speech outlining her belief that revolutionary technological change was coming to the global banking sector, but so far there has been little evidence of that change at ANZ – with this week’s announcements being the first indication of a major spending program in technology for some time. I would characterise the moves which ANZ Bank has made this week to invest in customer-facing technology as probably the minimum that it needs to make in order to stay competitive in today’s fast-moving banking environment. Like all of Australia’s banks, ANZ cannot afford to get behind in the race to develop mobile payments solutions, or else it will get overtaken not only by its peers, but by fast-moving global technology startups such as Square, which is revolutionising this space in the US. Square isn’t in Australia yet, but one suspects it’s only a matter of time. And yet it’s also true that ANZ is not committing to this strategy as heavily as rivals such as the Commonwealth Bank are. The bank’s goMoney application, for example, was a leader several years ago in Australia’s mobile payments space, but ANZ didn’t really do enough to develop it, and as a result it lost a massive amount of mindshare and potential. I don’t really think it’s enough for ANZ to launch an Android NFC app here, a debit/credit card processing app there. These are surface-level initiatives which Australians basically expect every major bank to be pursuing at the moment, but they don’t reflect either a strong investment in the space or deep understanding of the structural change which is sweeping the payments scene at the moment. Furthermore, it’s possible to make an argument that ANZ’s moves this week are a bit akin to re-arranging the deck chairs on the Titantic. While the bank focuses on customer-facing technology, it is still ignoring the elephant in the room – its ageing core banking platform, which will hold back the functionality of its surface-level initiatives until it eventually replaces or substantially upgrades it. Anyone who has used CommBank’s Internet banking platform recently will know it’s light years ahead of the competition. Transfers happen instantly, customers can change a thousand options and integrate everything and it just feels so modern, compared to the platforms offered by rivals like ANZ. And this isn’t just surface functionality — much of it stems from the underlying platform operated by CommBank. Westpac, Suncorp and NAB have, at least, acknowledged that their legacy platforms are an issue and are actively attempting to do something about them. But ANZ doesn’t appear to have a long-term plan for its own core banking platform, or if it does, it hasn’t shared that plan with the rest of the market. Right now, it’s not a huge issue; most customers probably don’t see the CommBank’s noticeably modernised platform as a huge advantage. But in five years’ time, when instant transfers between banks are becoming reality (CommBank can do that now) and mobile payments are mainstream, instead of merely a curiousity, it is likely that ANZ will be drastically far behind its competition. It is with this in mind that I have no choice but to judge the bank’s announcement this week as a positive move – but probably not positive enough.